Well moving back to Texas has some benefits, placing me within decent striking distance of both the Cowboys and Texans marketing departments. As a fan of the Texans I was aware of the team’s Community Player of the Month efforts sponsored through Whataburger. 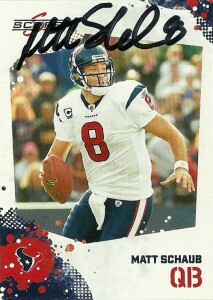 At about 4 hours drive and 200 miles flat, I thought it was worth the time to get Schaub on a card or two. It was of great hassle to get there as my GPS hadn’t had an update since 2007, so after I missed my turn, -under its direction I ended up off-roading in a Mazda Miata. Amazingly I did not get stuck in the mud however it was a hairy experience that I do not wish to duplicate. After about an 2 and a half hour wait in the Whataburger parking lot, I got both Joel Dreessen and Matt Schaub’s autograph. Matt has taken a lot of flak in the media, both from fanboys and armchair quarterbacks. As a traditional drop-back passer, Schaub is not a scrambler by nature and some people claim that he’s not an elite quarterback, but the thing is, you go out of Texas and the impression is much better. He has 10 comeback victories to his resume in his career and while people say that he’s only good because of Andre Johnson, I’d say that charge is unfair because he performed well enough for the Texans to grab him from the Falcons in the first place. Also other teams have those sort of connections but those charges are never leveled against guys like Matt Ryan, Matt Stafford, or Tony Romo for that matter. As 2011 continues, the pressure from a frustrated city and fan base continues to mount on Matt. Hopefully he will be able to deliver a playoff berth and at least a division title for the long suffering city of Houston.